The Bay of Fundy is world famous because it has the world’s highest tidal range. It is located between New Brunswick and Nova Scotia on Canada‘s east coast. The Spring tides are the highest but they do not occur in spring as their name suggests. They occur twice a month when the moon and sun align. The water in the bay takes about 13 hours (12 hours 26 minutes to be more accurate) to go from the mouth to the head of the bay and then back again. Although it is famous for its tides, it also has the Old Sow Whirlpool which is the largest whirlpool in the Western Hemisphere. The tides of the Bay of Fundy have enough power to reverse the flow of many rivers emptying into the bay. In just one tide cycle, approximately 100 billion tons of water flow in and out of the bay. The bay was formed millions of years ago as a result of the continental drift that caused the continents to part. The tides are intensified by the extended, delta-like shape of the Bay of Fundy. On the coast, the powerful tides have eroded cliffs and left sea stacks along the shoreline. The bay lies in a rift valley which is known as the Fundy Basin. It splits into Chignecto Bay in the northeast and the Minas Basin in the east. There are approximately 2 million sandpipers that can be found in the bay between July and October. The Fundy National Park forest is one of the highest biodiversity in marine life in the world. This bay is home to approximately 12 whale species along with seabirds, porpoises, dolphins, fish etc. Declan, Tobin. " 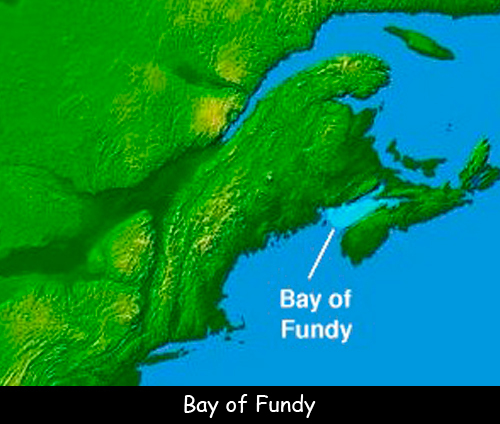 Facts for Kids about Bay of Fundy ." Easy Science for Kids, Apr 2019. Web. 18 Apr 2019. < https://easyscienceforkids.com/bay-of-fundy/ >.